This is a B-film noir set on a cruise ship. If nothing else, I can’t think of another film noir set entirely on a boat. Thus endeth my shortest pre-article intro ever. I watched DANGEROUS CROSSING (1953) on 1.25.14. It was my first viewing of the film. A newlywed couple, Ruth (Jeanne Crain) and John (Carl Betz) board a cruise for their honeymoon, just a month after meeting for the first time. John suggests he drop some money off safely, and they meet at the bar. He disappears. Ruth looks for him, but to no avail. This quickly becomes a paranoia thriller as John seems to have vanished and much of the cast and crew are working against her. None of the crew recall seeing John and Ruth board together, though it seems they should. The room number changes, with Ruth’s belongings properly delivered to a different room with no sign of John. As an audience we are privy to a phone call from John very early and a meeting later. We know he is alive (unless this is some kind of SHUTTER ISLAND craziness), so the movie is about Ruth’s inability to convince anyone of what she knows. 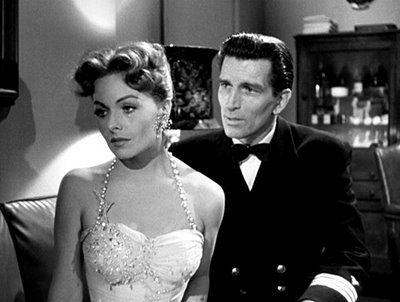 She has one ally in the ship’s doctor, Paul (Michael Rennie), but he is kind to her on account of her beauty, not because he believes her. This is an interesting little film. The female protagonist is front and center, unusual for a noir, and the villains are seemingly plentiful. The sense of paranoia works, and we get to see Ruth become more calculated as the film goes on in her dealings with the other folks on board. She’s beautiful and she uses that. She’s also cunning, and she has to learn to use that. The fault in the film lies in its inability to cast much doubt in the audience on who we should believe. Rather than suspecting Ruth we are aligned with her from the beginning. The movie redeems this with an unexpected twist in the climax, and a satisfactory ending. The chemistry between Rennie and Crain, as doctor and patient, is an asset (even if we aren’t talking Bogart/Bacall here). They make their characters a likable kind of eager. Even if the movie would be better if we could question Ruth more, it is not as if she is not a character who is easy to root for. All in all, this is a fine little B-side of a noir film. At 75 minutes it is not a big commitment, and it zips along at a brisk enough pace as to be entertaining. ~ by johnlink00 on January 25, 2014.